Practice makes perfect, and with Strive for a 5: AP Chinese Practice Tests, you can familiarize yourself with the AP test and sharpen your skills through practice. With its valuable suggestions and tips for test taking, this book of practice tests offers powerhouse drills that get you ready for the day of the exam! 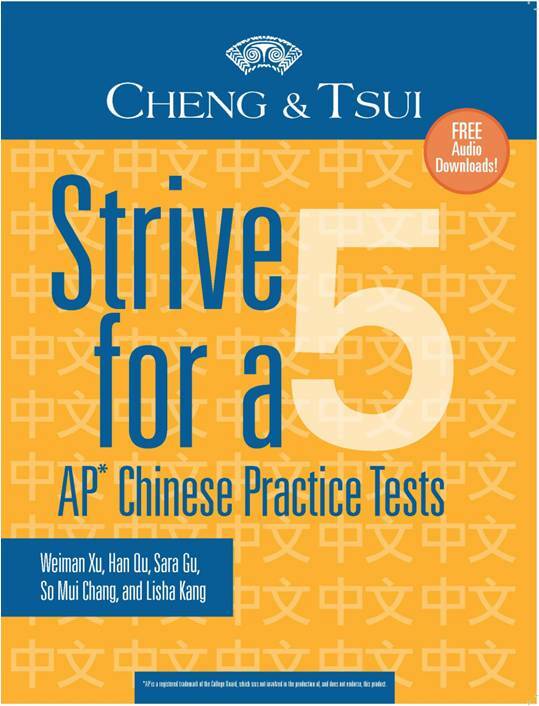 In Strive for a 5, eight full-length practice tests simulate the AP Chinese Language and Culture exam. Tests are organized by theme— Customs, Daily Life, Economics, Education, Entertainment, Family, Geography and Mixed Theme—so teachers may use any unit from this workbook to supplement the cultural theme that they are teaching. This book contains everything needed to prepare for the exam, including an introduction to the AP Chinese exam’s structure and organization, study suggestions, as well as intense practice covering all major themes that are generally taught in the AP Chinese course. Turn to page 202 in your book. Fill in the missing performing art from the list in the second paragraph: "Beijing Opera, ____, martial arts, etc."